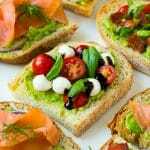 This recipe for avocado toast includes three different flavor variations with caprese, BLT and smoked salmon options. Avocado toast is a festive yet easy appetizer for any gathering and also makes for the perfect lighter breakfast or lunch! Cut The Rustik Oven bread slices in half crosswise. I recommend using the Sourdough bread for the BLT toast, the Artisan White for the caprese toast, and the Hearty Grains & Seeds for the smoked salmon toast. Toast the bread until light golden brown. Place the avocado, olive oil, lemon juice, salt and pepper in a medium bowl. Use a fork to mash the avocado to make a coarse paste. Spread the avocado over the bread slices. Cut half of the cherry tomatoes into quarters and cut the remaining cherry tomatoes in half. Arrange the quartered cherry tomatoes, romaine lettuce and bacon over 4 avocado toast slices. Arrange the smoked salmon, red onion and dill over 4 avocado toast slices. Arrange the halved cherry tomatoes, mozzarella balls and basil over the remaining 4 avocado toast slices. Drizzle with balsamic glaze. Serve the avocado toast immediately.